Part 3 of an in-depth 3-part series. Read Part 1 and Part 2. In Parts one and two of this series, I discussed the types of gift aid and loan options that you will find on the “typical” financial aid award letter. I use the word “typical” loosely in this context mainly because there are no standardized formats that institutions have to abide by when designing their award letters. A school’s commitment to follow voluntary “best practices” is as binding as a promissory handshake. 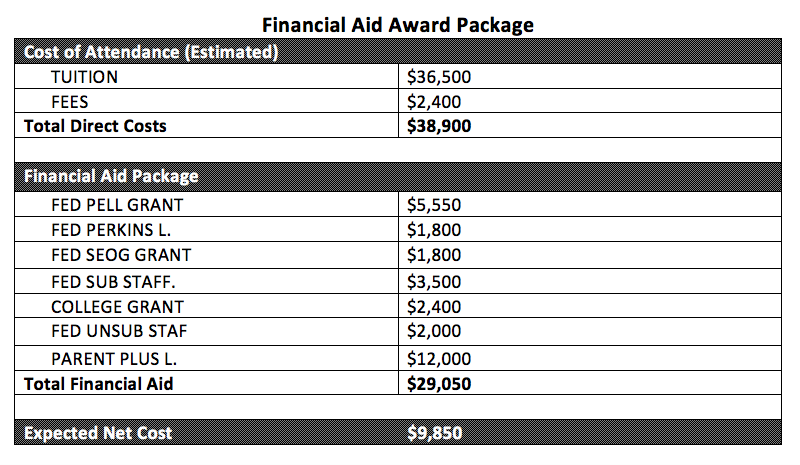 Now that you have a better understanding of what to look for in your award letter, I’d like to go through a few examples of both good and bad financial aid packages to help you develop a discerning eye for deceptive practices. What Does A Problematic Award Letter Look Like? The Cost of Attendance only includes direct costs (Tuition & Fees) but leaves out all of the indirect costs including room and board, books and supplies, transportation, and personal expenses. Unfortunately, this distorts the expected net cost, since only 40% of the total cost of attendance of a four-year public college is represented by tuition and fees. Some observers will argue that indirect costs shouldn’t have to be included because livings costs would come out of the student’s coffers regardless of whether they attend college or not. But what this argument fails to consider is that full-time students do not have the same earning potential as a full-time employee—what economists refer to as opportunity costs. Toiling through the excessive use of abbreviated words makes the letter seem more like a lost relic to be deciphered. We’re not pretending to be raiders for the lost ark; we just want to know how much college is going to cost us. There is no distinction between gift aid and loan options in the example above. The exclusion of current interest rates for each loan type makes it more difficult to determine which types of loans a parent or student would prefer to exhaust first. Nor is there an amortization chart to clearly illustrate how much the loan will cost on a monthly-basis or in total. Including the Parent Plus Loan in the financial aid package is misleading, as it lowers the expected net cost to a level that seems more reasonable than if it were presented as part of the net price to be paid out-of-pocket. By leaving out the total net price (as opposed to the net cost), the school seems more attractive than what it really is. It appears that the sticker price is only $9,850. However, more realistically, the net price that you would have to pay to attend this school would be $35,686 when including loan payments with interest. What Does a Transparent Award Letter Look Like? 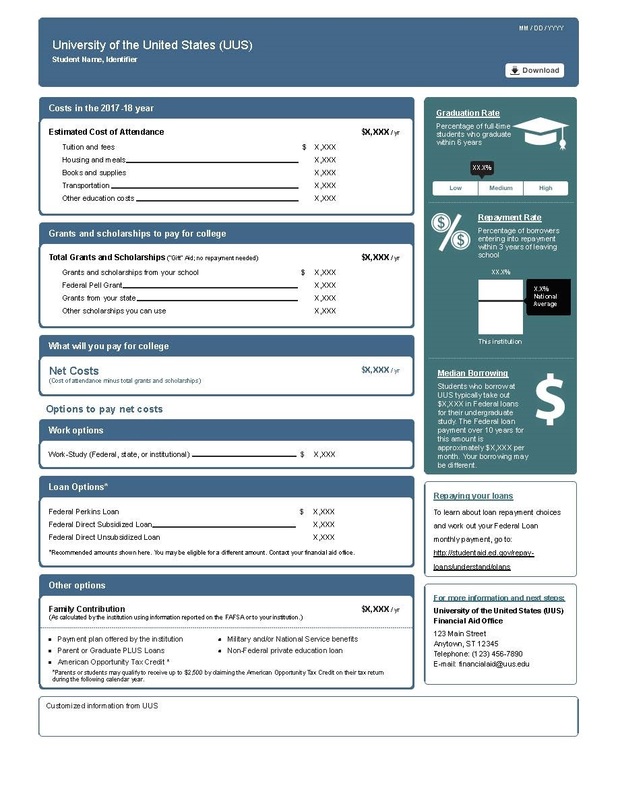 Recognizing a need to create a standardized award letter that presents the most important information in an easily readable format, The Consumer Financial Protection Bureau (CFPB) and the U.S. Department of Education have teamed up to develop what is now known as the Financial Aid Shopping Sheet. As of January 2017, 3,278 institutions have voluntarily adopted the Financial Aid Shopping Sheet as the template for their award letters. This accounts for the enrollment of nearly 75% of all undergraduates (not including Non-Title IV Eligible schools). Hopefully as more and more schools adopt this standardized model, fewer parents and students will fall victim to the rampant misinformation. I’ve posted a copy of the Shopping Sheet template for the 2017-2018 academic year, which you can download here. The Gift Aid (Grants and Scholarships) is itemized separately from loans. A subtotal for the amount of gift aid offered is shown and has been subtracted from the cost of attendance to yield the net price (which they refer to as “Net Cost” in the updated standardized model). There is no attempt to mask the loan options as gift aid. While great strides have been taken to alleviate confusion on the part of the parent and prospective student, there is still room for improvement, however marginal. For instance, a crucial piece of information that remains to be included on the Financial Aid Shopping Sheet is the list of loans along with their respective interest rate, monthly payment, and total interest and payments over the life of the loan. It’s also a good idea to note that even when the college factors indirect costs into the total cost of attendance, there’s a good chance that these figures are unrealistically low. Then again, individual lifestyle choices are never clear-cut. Now that you have a better grasp of what to expect when your child receives their financial aid award letters, you will be better equipped to make informed choices when the time presents itself. No doubt by now, you realize that award letters can be confusing, but by knowing how to interpret them, you’ll be able to circumnavigate the potential financial landmines that others fail to recognize.